The purpose of principal component analysis is to find the best low-dimensional representation of the variation in a multivariate data set. For example, in the case of the wine data set, we have 13 chemical concentrations describing wine samples from three different cultivars. We can carry out a principal component analysis to investigate whether we can capture most of the variation between samples using a smaller number of new variables (principal components), where each of these new variables is a linear combination of all or some of the 13 chemical concentrations. To carry out a principal component analysis (PCA) on a multivariate data set, the first step is often to standardize the variables under study using the “scale()” function (see above). This is necessary if the input variables have very different variances, which is true in this case as the concentrations of the 13 chemicals have very different variances (see above). Once you have standardized your variables, you can carry out a principal component analysis using the “prcomp()” function in R.
In this case, we see that the total variance is 13, which is equal to the number of standardized variables (13 variables). This is because for standardized data, the variance of each standardized variable is 1. The total variance is equal to the sum of the variances of the individual variables, and since the variance of each standardized variable is 1, the total variance should be equal to the number of variables (13 here). The most obvious change in slope in the scree plot occurs at component 4, which is the “elbow” of the scree plot. Therefore, it could be argued based on the basis of the screen plot that the first three components should be retained. We see that the variance is above 1 for principal components 1, 2, and 3 (which have variances 4.71, 2.50, and 1.45, respectively). Therefore, using Kaiser’s criterion, we would retain the first three principal components. A third way to decide how many principal components to retain is to decide to keep the number of components required to explain at least some minimum amount of the total variance. 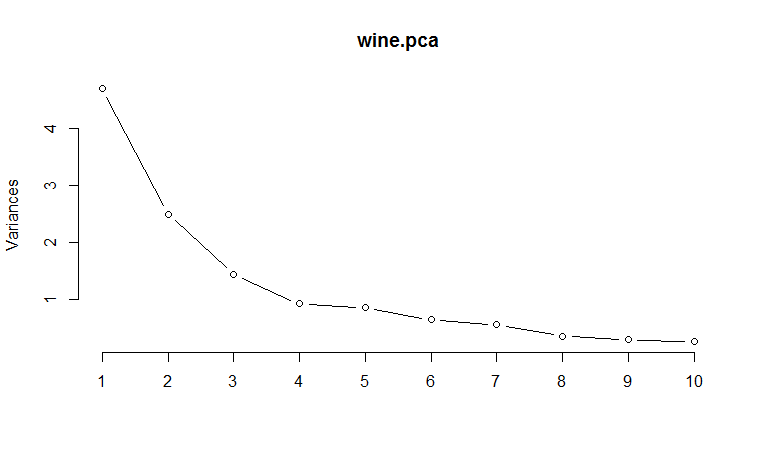 For example, if it is important to explain at least 80% of the variance, we would retain the first five principal components, as we can see from the output of “summary(wine.pca)” that the first five principal components explain 80.2% of the variance (while the first four components explain just 73.6%, so are not sufficient). The loadings for the principal components are stored in a named element “rotation” of the variable returned by “prcomp()”. This contains a matrix with the loadings of each principal component, where the first column in the matrix contains the loadings for the first principal component, the second column contains the loadings for the second principal component, and so on. This means that the first principal component is a linear combination of the variables: -0.144*Z2 + 0.245*Z3 + 0.002*Z4 + 0.239*Z5 – 0.142*Z6 – 0.395*Z7 – 0.423*Z8 + 0.299*Z9 -0.313*Z10 + 0.089*Z11 – 0.297*Z12 – 0.376*Z13 – 0.287*Z14, where Z2, Z3, Z4…Z14 are the standardized versions of the variables V2, V3, V4…V14 (that each have mean of 0 and variance of 1). We see that they do agree. The first principal component has highest (in absolute value) loadings for V8 (-0.423), V7 (-0.395), V13 (-0.376), V10 (-0.313), V12 (-0.297), V14 (-0.287), V9 (0.299), V3 (0.245), and V5 (0.239). The loadings for V8, V7, V13, V10, V12 and V14 are negative, while those for V9, V3, and V5 are positive. Therefore, an interpretation of the first principal component is that it represents a contrast between the concentrations of V8, V7, V13, V10, V12, and V14, and the concentrations of V9, V3 and V5. This means that the second principal component is a linear combination of the variables: 0.484*Z2 + 0.225*Z3 + 0.316*Z4 – 0.011*Z5 + 0.300*Z6 + 0.065*Z7 – 0.003*Z8 + 0.029*Z9 + 0.039*Z10 + 0.530*Z11 – 0.279*Z12 – 0.164*Z13 + 0.365*Z14, where Z1, Z2, Z3…Z14 are the standardized versions of variables V2, V3, … V14 that each have mean 0 and variance 1. The second principal component has highest loadings for V11 (0.530), V2 (0.484), V14 (0.365), V4 (0.316), V6 (0.300), V12 (-0.279), and V3 (0.225). The loadings for V11, V2, V14, V4, V6 and V3 are positive, while the loading for V12 is negative. Therefore, an interpretation of the second principal component is that it represents a contrast between the concentrations of V11, V2, V14, V4, V6 and V3, and the concentration of V12. Note that the loadings for V11 (0.530) and V2 (0.484) are the largest, so the contrast is mainly between the concentrations of V11 and V2, and the concentration of V12. The values of the principal components are stored in a named element “x” of the variable returned by “prcomp()”. This contains a matrix with the principal components, where the first column in the matrix contains the first principal component, the second column the second component, and so on. Thus, in our example, “wine.pca$x[,1]” contains the first principal component, and “wine.pca$x[,2]” contains the second principal component. The scatterplot shows the first principal component on the x-axis, and the second principal component on the y-axis. 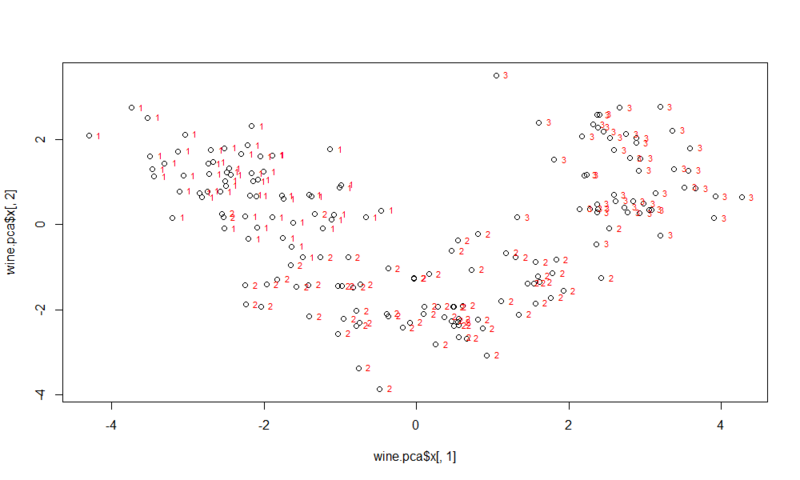 We can see from the scatterplot that wine samples of cultivar 1 have much lower values of the first principal component than wine samples of cultivar 3. Therefore, the first principal component separates wine samples of cultivars 1 from those of cultivar 3. We can also see that wine samples of cultivar 2 have much higher values of the second principal component than wine samples of cultivars 1 and 3. Therefore, the second principal component separates samples of cultivar 2 from samples of cultivars 1 and 3. Therefore, the first two principal components are reasonably useful for distinguishing wine samples of the three different cultivars. Does it make sense that the first principal component can separate cultivar 1 from cultivar 3? In cultivar 1, the mean values of V8 (0.954), V7 (0.871), V13 (0.769), V10 (0.539), V12 (0.458) and V14 (1.171) are very high compared to the mean values of V9 (-0.577), V3 (-0.292) and V5 (-0.736). In cultivar 3, the mean values of V8 (-1.249), V7 (-0.985), V13 (-1.307), V10 (-0.764), V12 (-1.202) and V14 (-0.372) are very low compared to the mean values of V9 (0.688), V3 (0.893) and V5 (0.575). Therefore, it does make sense that principal component 1 is a contrast between the concentrations of V8, V7, V13, V10, V12, and V14, and the concentrations of V9, V3 and V5; and that principal component 1 can separate cultivar 1 from cultivar 3. Above, we interpreted the second principal component as a contrast between the concentrations of V11, V2, V14, V4, V6 and V3, and the concentration of V12. In the light of the mean values of these variables in the different cultivars, does it make sense that the second principal component can separate cultivar 2 from cultivars 1 and 3? In cultivar 1, the mean values of V11 (0.203), V2 (0.917), V14 (1.171), V4 (0.325), V6 (0.462) and V3 (-0.292) are not very different from the mean value of V12 (0.458). In cultivar 3, the mean values of V11 (1.009), V2 (0.189), V14 (-0.372), V4 (0.257), V6 (-0.030) and V3 (0.893) are also not very different from the mean value of V12 (-1.202). In contrast, in cultivar 2, the mean values of V11 (-0.850), V2 (-0.889), V14 (-0.722), V4 (-0.444), V6 (-0.364) and V3 (-0.361) are much less than the mean value of V12 (0.432). Therefore, it makes sense that principal component is a contrast between the concentrations of V11, V2, V14, V4, V6 and V3, and the concentration of V12; and that principal component 2 can separate cultivar 2 from cultivars 1 and 3. Next post: What is Multivariate Analysis? Part III: Linear Discriminant Analysis.